For me, nothing beats rice, fish and a little salad for a lazy lunch on Sundays. I can’t help it, I’m from Kerala. Rice, seafood, coconut, plantains and mangoes are like the panchratnas of Kerala cuisine. 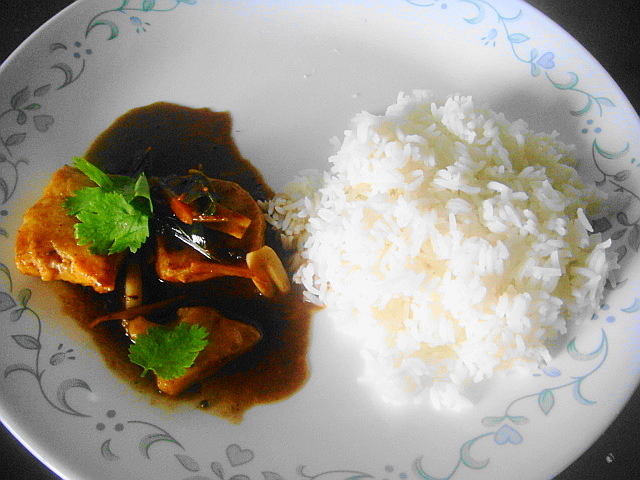 I wanted to make it a Holy Trinity of ingredients, but realised that we Malayalees covet more than just rice and fish. And if I start ticking off more things in my head, even my panchratna-usage will become redundant. I only recently started cooking fish, and my repertoire consisted of fish moilee and Kerala-style fish fry with a very basic spice rub. Since my husband and I have eaten a year’s worth of moilee and fry, it was time to make something new! I’ve always liked the combination of sweet and sour and have eaten all kinds of Oriental seafood dishes that incorporate those flavours. This dish has 2 sources of inspiration: Kylie Kwong’s steamed chicken with hot and sour dressing and steamed fish with chilli-lime sauce. I wanted to use Kylie’s method of pouring a hot, spicy dressing over steamed chicken strips and put a desi spin on it by using curry leaves and mustard seeds. I bought some more basa fillets (I’m new at this, so de-boned fillets just work better for me,) and got out some tamarind paste, jaggery, mustard and methi (fenugreek) seeds and some curry leaves. I steamed the fish separately and just placed them in the bubbling curry for about 3-4 mins before finishing it off with some curry leaves on top. I’ve been a little obsessed with cutting things into matchstick sizes these days, especially ginger and raw mangoes. So I went a little berserk and chopped a little bowlful! I wanted to avoid using chilli altogether; and allow the heat to come solely from freshly chopped ginger. But l had to add some crushed chilli to cut through the sourness of the tamarind. In a large pot, heat 1 ½ cups water. 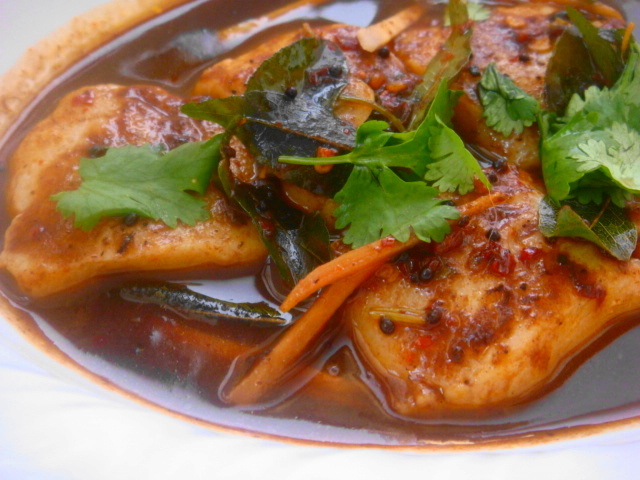 Once the water starts bubbling, add the tamarind paste and stir it around so that there are no lumps. The add the jaggery and dissolve. Stir the mixture around till it thickens a bit. Remove from heat and keep aside. In the same pot, pour 2 tablespoons of coconut oil. When the oil is hot, add the mustard and methi seeds, then the curry leaves and chopped ginger. Once the ginger browns a bit, add some crushed chilli flakes or chilli powder. Then pour in the tamarind-jaggery liquid and let it simmer for a few minutes. Next, add the steamed fish fillets and a teaspoon of chopped coriander stems. 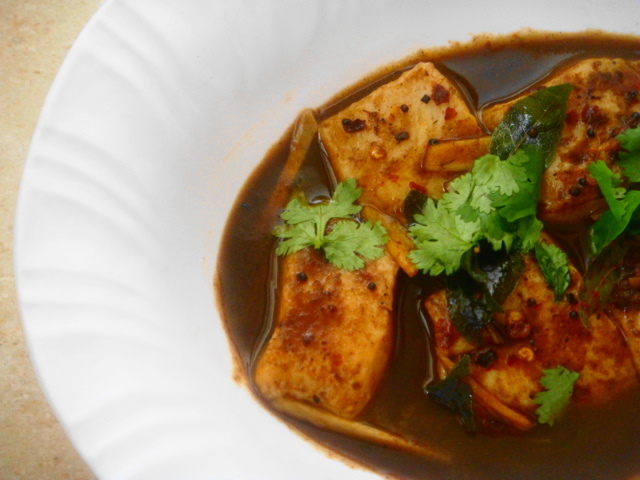 Let the curry bubble for a few minutes more, so that the fish can absorb the flavours. « CNN’s 50 Most Delicious Foods!! @Pri: Yup, it actually is ‘meen’ curry! Meen. Why can’t you open up a restaurant?